Born 1976 in Moscow, Jacob Katsnelson displayed exceptional musical talent at a very early age, entering the Music School for Gifted Children of the famed Gnessin Institute at five in 1981. Choosing to specialize in flute and piano he obtained diplomas with “highest distinction” in both instruments in 1993; and thereafter continued studies in the master class of the renowned pianist Elisso Virsaladze at the Tchaikovsky Conservatory in Moscow. In 1992 he obtained a distinction in the Russian Com­petition for Young Musicians as well as in the 10th International Competition J. S. Bach in Leipzig (1996). In 1999 he was finalist at the Concours Musical International Reine Elisabeth de Belgique in Brussels; and in 2000 semifinalist at the Concours Géza Anda in Zurich. 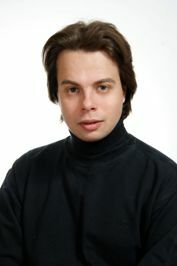 In 2001 he was a laureate of the International Piano Competition in Tbilisi (Georgia) where he also received the Special Prize for the Best Interpretation of a Work by Beethoven. In 2003 he was one of three finalists at the Concours International de Piano Clara Haskil in Vevey (Switzerland) and in 2005 obtained second prize at the First International Piano Competition Sviatoslav Richter in Moscow. He also formed the piano trio Akadem which won first prize at the 1999 Taneyev Chamber Music Competition in Kaluga (Russia) and in 2000, second prize at the International Chamber Music Competition in Trapani (Sicily). He has performed recitals and chamber music concerts in Russia (e.g. each year at the ”Homecoming Festival” in Moscow), Germany, Belgium, Holland (Kamermuziek Festival Utrecht with Janine Jansen, Boris Brovtsyn, Maxim Rysanov, Misha Maisky, etc. ), France, Switzerland, the United Kingdom, Northern Ireland, USA, Spain, Italy, Hungary, Estonia (Festival Hiiumaa), Latvia, Georgia, Kazakhstan, Bosnia, Israel… He has also appeared as soloist with well known orchestras such as the Philharmonic Orchestra of Saratov in Moscow, and those of Nizhny Novgorod, Saint-Petersburg, Brussels, Switzerland, Georgia, Chisinau/Moldavia, Baku/Azerbaijan, Rhodes. Besides many life records in the concert halls of Tchaikovsky Conservatory Jacob Katsnelson produced a CD with Kristine Blaumane, cello, featuring compositions of S. Barber, E. Grieg and B. Martinu; another one with the violist Maxim Rysanov playing Brahms. His CD with solo works of J. S. Bach appeared recently under the label Quartz (QTZ 2084). Jacob Katsnelson is professor at the Tchaikovsky Conservatory in Moscow and teaches lieder interpretation at the Gnessin Institute in Moscow.